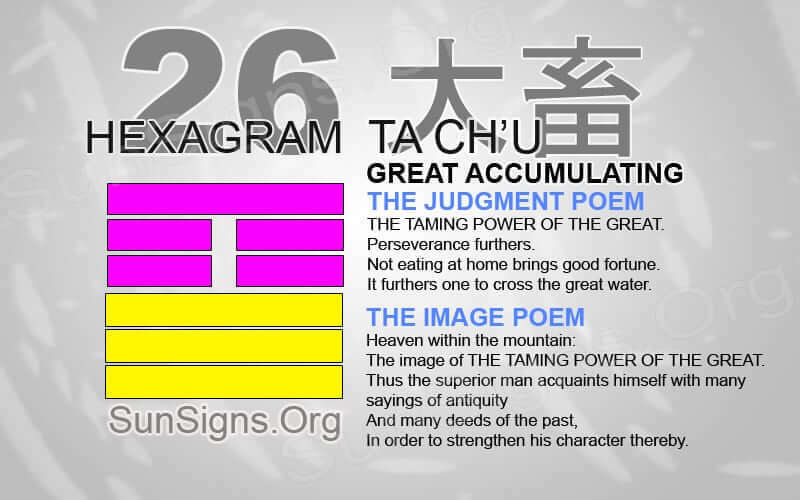 What Is I Ching Hexagram 26 All About? Hexagram 26 teaches to gather together all types of resources to succeed. Responsibly utilizing these resources will bring balance to an individual’s life. Also, it will balance the lives of those around them. Others could benefit from these resources, or they will get wasted on ill-advised tasks. When unsure of what to do with storage of great resources, take the time to listen to others. They will have greater wisdom and knowledge. This advice could be the key to gaining balance in life. A resource could be personal wealth that should be used in moderation and with a clear mind. Another example would be knowledge on a particular topic that someone could benefit from understanding more about. There are several different types of gifts and resources that a person can thoughtfully gather together. They can use these to strengthen themselves and those around them. Hexagram 26 gives wisdom on the importance of gathering together important resources. Doing so in a disciplined manner will help prepare an individual for success. Having a great accumulation of resources and not using them wisely can often lead to hoarding of important skills. Once the point of great accumulation occurs, it is now time to decide the best route. Then, you can use all of these resources successfully. When having storage of resources, there are many temptations. You may want to use these skills and power in the wrong ways or discriminating tasks. Donating to someone who does not benefit from wealth is one example. He will only waste this resource, in turn, the same as throwing away a precious resource. Using an asset to gain power over others is another example of wasting a resource. With great power comes great responsibility. It is up to those individuals who possess a great accumulation of resources to use them for a greater good. Or else, that person will not be able to succeed in the long run. I Ching 26 divination asks you to take the time to meditate on certain items you can gather together. This will bring about a great good either in your personal life or in the community. Resources could be in connection with others in society who can provide necessities others might need. Perhaps there is a project in the community that you should complete via the resources you are willing to provide. Another situation could be a local campus or school could benefit from the knowledge an individual might specialize in. Or there could be a local service project that could use either the extra help. This can be in the form of serving others or a donation that could influence the success of that program. Whatever the task, take the time to ponder deeply before using resources in one field. Make sure it is a worthy cause. Do not be impulsive in your actions. Indulge your family and lovers but not to the point of wasting resources and making them dependent on you. Teach them how to utilize these resources and make the most of it. Asking for advice at work is not a form of weakness but inner strength to seek out a better route. There may be someone in the same field of study or the work area. I Ching 26 says that he may have also gained an accumulation of resources. Thus, he will understand the struggles that come with managing these resources. The image of THE TAMING POWER OF THE GREAT. To strengthen his character thereby. Being unsure of what to use essential resources for is normal. Take the time to speak with those who are more wise and knowledgeable. They will know about these types of resources and how you can use them. Remember that Hexagram 26 calls for a time to gather together assets. You need to do this to improve the life of individuals and those around you. Beware of using gifts impulsively or keeping them all in storage without any use. One person is capable of bringing about a significant change or a continuous period of hardship.